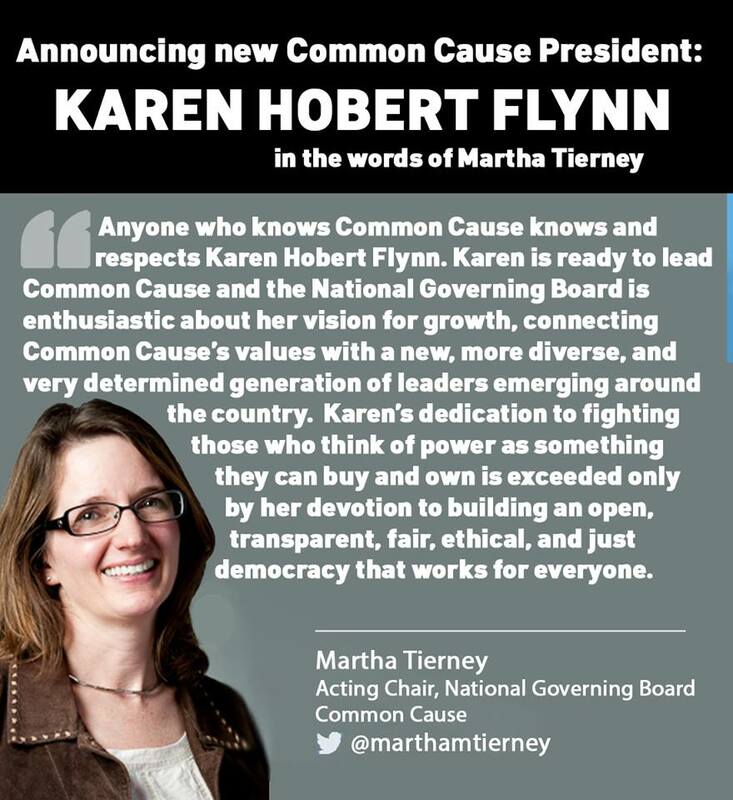 Washington, DC — Karen Hobert Flynn, a democracy reform activist and leader for more than three decades, including 25-plus years on staff and in state and national leadership positions with Common Cause, has been named the organization’s president. 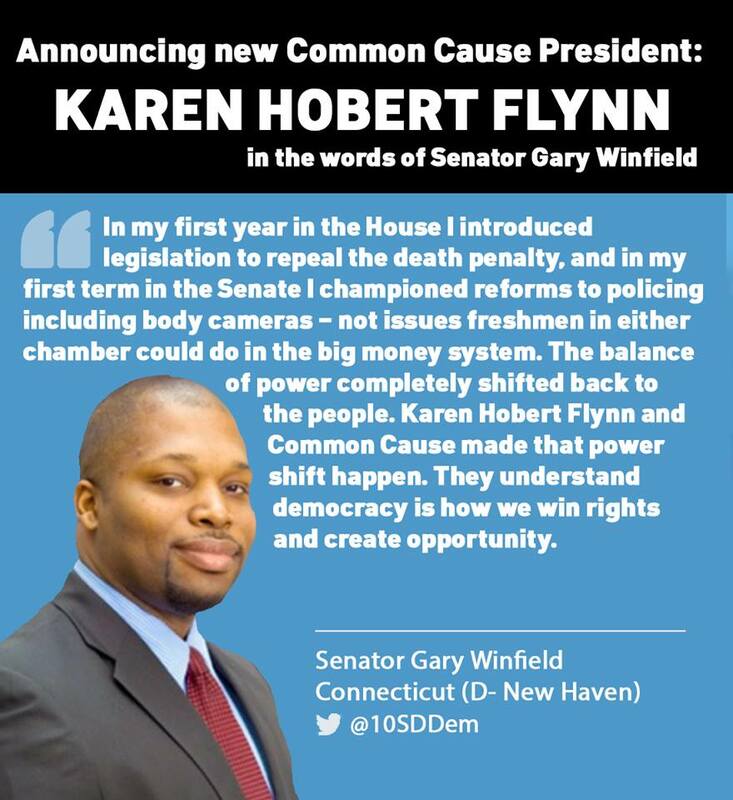 “I’m excited and ready to lead Common Cause, connecting the values that make Common Cause unique in these polarized political times to the growing grassroots movement demanding democracy reform,” Hobert Flynn said. Hobert Flynn, named to the post by the organization’s National Governing Board, is the first Common Cause president who once served as a state level director for the organization. She succeeds Miles Rapoport, who is stepping down as president and will serve as a senior advisor through September 30, 2016 to ensure a smooth transition. “Miles Rapoport is a great leader with an impressive track record that includes his two-plus years at Common Cause,” said National Governing Board Acting-Chair Martha Tierney. “Miles challenged us to connect with the people our work impacts and shine light not only on secret money, but also the people harmed by the policies that money buys,” she added. Tierney noted the board conducted a thorough and deliberative process, after which the board’s vote was unanimous. “We conducted a national search just a little more than two years ago. Even if we didn’t know Karen Hobert Flynn, her experience, accomplishments, and leadership fit the criteria we set then and now. We’re thankful and fortunate she built her record of success at Common Cause.” Tierney said. 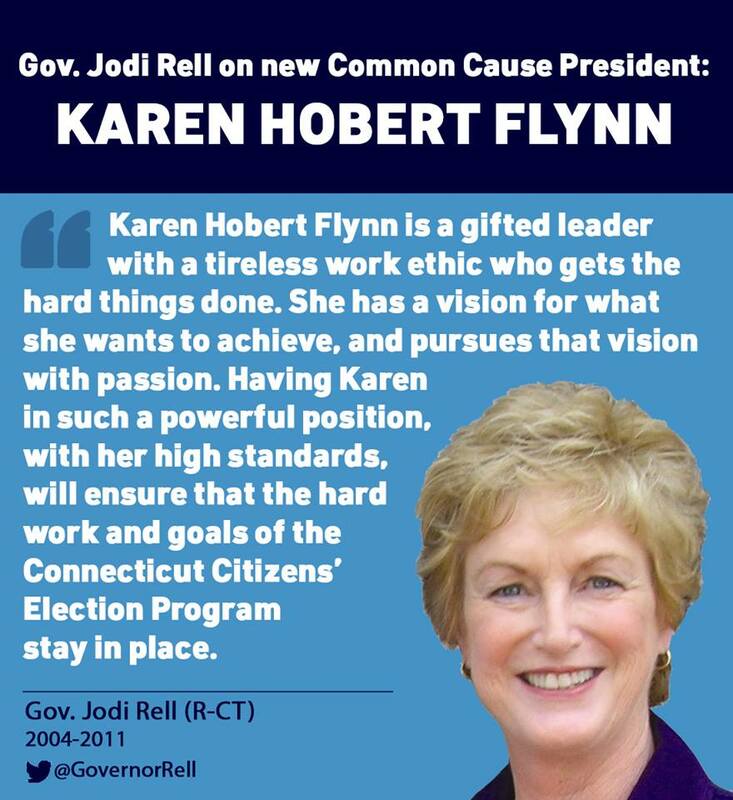 “Karen’s roots in Common Cause mean she will do what John Gardner always envisioned and make sure Common Cause’s work is relevant to issues of today, grounded in the core values that govern our democracy. She will ensure we are as innovative in our organizing tactics with new tools and technology to connect and empower voters, as he was in starting the organization 46 years ago,” Tierney said. Common Cause is the nation’s original and largest non-partisan, good government watchdog. The organization promotes a comprehensive agenda of democracy reforms to reduce barriers to participation, including small-dollar donor based campaign finance systems, online and automatic voter registration, impartial citizen redistricting commissions, media laws that protect the free flow of information, and works for a more reflective democracy that truly represents the rich diversity of 21st Century America. Former Common Cause President Fred Wertheimer (1981-1995), praised Miles Rapoport for his leadership of Common Cause and for his many years as a national leader of the public interest movement. Wertheimer has known and worked with Hobert Flynn for more than two decades. Hobert Flynn is a principal architect of Connecticut’s Citizens’ Election Program, which established small-dollar donors as the financial center of state politics, which shifted power away from lobbyists and back toward people. The program has given the state a more diverse legislative body, able to deal with issues that matter to constituents, not wealthy special interests. As Chair of Common Cause Connecticut, she led the fight to pass the law with a coalition 50 organizations, now in its fifth election cycle and more popular than ever, with 74% of candidates participating. Hobert Flynn started at Common Cause in 1985 and served as Director of the Campaign Finance Monitoring Project and Director of the Washington Connection doing grassroots organizing with Common Cause volunteers and activists (1985-1989). She served on the board of Common Cause New Jersey before moving to Connecticut in the fall of 1994. Since then, she has served as Executive Director and then Chair of Common Cause Connecticut (1995-2007), Vice President of State Operations (2007-2012), and Senior Vice President for Strategy and Programs (2012-2016). She was named President on June 10, 2016. In addition to Common Cause, Karen worked at Public Citizen and Center for Science in the Public Interest and as Field Director of the Long Term Care Campaign, funded by AARP, Families USA, and the Alzheimer’s Association. “What excites me the most about this moment is that Americans are engaging in democracy reform in growing numbers and that the generation just coming into awareness of their political power, the New American Majority — more diverse, less ideological, and more engaged — is prioritizing democracy reform,” Hobert Flynn said. “Our country’s emerging leaders embrace Common Cause’s non-partisan approach with new energy and vision that gives me hope for the future. “In their enthusiasm, I see myself walking into my first job at Common Cause 25 years ago and finding my life’s calling. 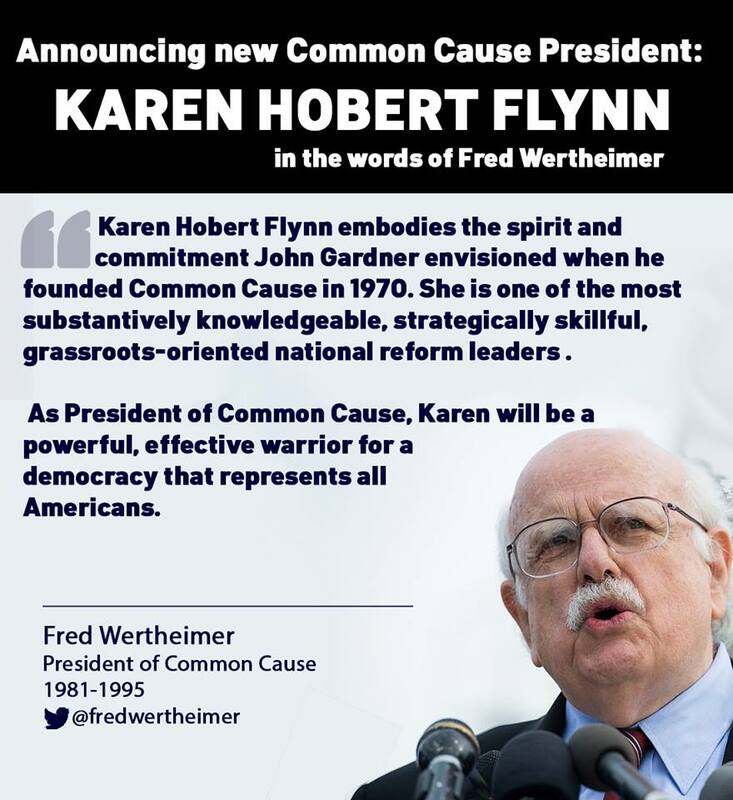 Like the leaders of Common Cause then, my commitment is to work with the generation learning leadership now; together we will build a 21st Century democracy that works for all Americans, not just wealthy special interests,” Hobert Flynn said. “The next generation seems to know what our founder John Gardner knew, that people are the only true power in our democracy, but we must organize to exercise that power,” she said. Hobert Flynn’s career at Common Cause spans more than half of the organization’s nearly 50 years, which helps her shape the agenda and strategy it pursues today. In addition to money in politics, Common Cause works to reduce barriers to participation as a recognized leader for impartial redistricting commissions to end gerrymandering. In Florida, where state advocates were part of a coalition that challenged and won court-ordered redistricting this year to correct partisan gerrymandering, there are more competitive political races in the state than they’ve had in decades. Long a leader in election protection work, expanding ballot access and removing obstacles that prevent people from voting, from restoring voting rights for formerly incarcerated people to leading the fight for the first Automatic Voter Registration laws, Common Cause is committed to modernizing and simplifying the registration process so it is accessible and secure. Drove passage of the 26th Amendment, lowering the voting age to 18. Filed legal action against the Committee to Re-Elect the President (CREEP) in 1972 that led to multiple investigations and the resignation of President Richard Nixon. Secured, defended, and worked to strengthen common sense limits on the influence of money in politics. Successfully won state and local laws permitting public financing of campaigns. Exposed ethical breaches that drove two House Speakers and a Majority Leader from office and led to the creation of an ethics and oversight agency in the House. Wrote and secured passage of landmark California legislation, now a model for the nation, putting citizens in charge of drawing legislative boundaries and ending partisan gerrymandering. Spearheaded exposure of the workings of the American Legislative Exchange Council (ALEC), the tax-exempt lobby that puts corporate interests ahead of the common good, leading to more than 100 major corporations revoking their affiliation with ALEC. Put a check on media consolidation, advocating for a free and open media and internet neutrality and accessibility. Secured disclosure laws in 23 states since the Citizens United decision to improve transparency of political spending. Worked in a coalition on the campaign that led 16 states, more than 680 municipalities, and the majority of the U.S. Senate in 2012 to support a constitutional amendment to overturn Citizens United. Helped reform U.S. Senate rules that block progress and create gridlock. Passed the first Automatic Voter Registration laws, modernizing election process to make registering and voting convenient and secure. "Hate and Oppression of Any Group Impacts Us All"